THE INTEGRATOR reproduces the entire thrust and movement components of TOGGLE RECOIL, the classic Chiropractic Method of adjusting by hand at a speed of 1/10,000th of a second. No instrument in chiropractic history has been able to reproduce what the hands were intended to do! Many other features are built into the Integrator however the precocking/tip sensitive automatic release mechanism makes the Integrator the first and only chiropractic adjusting instrument capable of totally true inter-professional reproducibility. 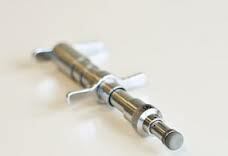 This instrument, also known as the Torque Adjustor™ is unlike other hand held instruments. The Integrator has true force adjustment as well as choice of three tip sizes, shapes and density characteristics to allow for the chiropractor the greatest outcome in correcting almost any subluxation that can present itself.